Titanium-A battle plate; resistant to around 5 plasma bolts. "A dozen Covenant superior battleships against a single Halcyon-class cruiser. Given those odds, I'm content with three...make that four kills." The Halcyon-class light cruiser, known as the Human Attack Ship class C-II by the Covenant, is a United Nations Space Command cruiser starship classification designed by Dr. Robert McLees before 2507, with a hull classification symbol of C.
Their service lives were short due to a unique hull design that was costly to construct and maintain with low maneuverability, poor armament, and concerns about their tactical viability. They were replaced by the Marathon-class cruiser. Despite the disadvantages of the original design, the heavily modified UNSC Pillar of Autumn proved to be one of the most effective, and costly, ships deployed in the war. Halcyon-class cruisers are composed of five hexagonal and octagonal sections mounted onto each other. The bridge is slung underneath one of the forward sections and eight docking bays are distributed throughout the ship. There are also slots for eighteen lifepods on the ship's hull. Lastly, the MAC cannon is visible as a bump on the bow. The most noteworthy design feature was a series of internal cross bracings and honeycombs designed by Doctor Robert McLees. This internal superstructure made the ships surprisingly resistant to battle damage; ships of the class were able to remain operational despite sustaining breaches to all compartments and losing 90% of their armor. The durability of the design was demonstrated by the UNSC Pillar of Autumn when she survived a crash-landing on Alpha Halo after taking a tremendous beating at Reach and over the ring. However, while the cruiser was intact, it was damaged beyond repair and could never fly again, although some systems were still online such as the fusion core, engines, and self-destruct. Another example of the ship's durability was during the Fall of Reach when the ship took on an immensely powerful Covenant warship. Having wrecked havoc on Reach's defense fleet, this formidable Covenant warship breached the Autumn's hull with two piercing beam attacks, one of which severely damaged its reactors. Not only did the Autumn continue its engagement with limited loss of functionality, it destroyed the Covenant vessel after a protracted battle. However, the special superstructure was deemed unnecessarily over-massed and costly due to its cross-bracings and interstitial honeycombs. This led to the design being dropped from future models of Halcyon-class ships. The Pillar of Autumn and 10/50 others were built with this type of superstructure. A number of service corridors ran the length of the ship. Although normally restricted to personnel, they could be accessed by lifts in main engineering or connecting passageways from the docking bays. If necessary, these expansive corridors, including a Class Seven service corridor running along the dorsal structure of the vessel, could permit passage to Warthogs and some sections were large enough to accept Pelicans. The corridors served a secondary purpose of lessening the ship's considerable mass, thereby increasing acceleration. Halcyon-class cruisers were constructed in space and are not rated for atmospheric deployment; however, R7 thrust couplings allow them limited atmospheric operation capabilities, as demonstrated by the Pillar of Autumn which was capable of achieving liftoff from Aszod, supported by a series of rocket pods. Armories were located throughout the ship, holding a selection of small arms and their requisite ammunition. Eight docking bays allowed a number of Pelican dropships, GA-TL1 Longsword Interceptors, M12 Warthogs and M808B Scorpion tanks to be carried. Halcyon-cruisers were often found with eighteen Class-3 Bumblebee lifeboats, in case the ship's crew must be evacuated. Because of the low number, these were likely used only as a last resort if Pelicans or other modes of transportation were not available. Sublight thrust is provided by nuclear fusion reactions which are channeled to two primary and twelve secondary adjacent exhausts at the ship's exterior stern. There are six exhausts visible, two large and four small. These engines are powered by fusion reactions between atomic nuclei of the hydrogen isotope deuterium. The main engine core consists of three underpowered Mark II Hanley-Messer reactors which provided 10% of modern engine output as of 2552. On the refit ships, specifically the Pillar of Autumn, the reactor system was one of the aspects which was heavily retrofitted. The Autumn was installed with an experimental reactor architecture which used a set of one primary reactor and two secondary reactors; when operating in concert, the magnetic fields of the secondary reactors could boost the main reactor's power generation capabilities up to 300%. The class was also equipped with a Shaw-Fujikawa Translight Engine for translight speeds. The primary armament of the Halcyon-class was its single Magnetic Accelerator Cannon. It was armed with only six Archer missile pods which was far below standards at the time. Each pod would have contained several individual missiles. The class was equipped with four Shiva-class nuclear missiles and numerous M910 50mm point-defense guns. With the outbreak of the Human-Covenant War, Halcyon-class ships were put through extensive refits. At least one ship, the Pillar of Autumn, had the following armament one upgraded Magnetic Accelerator Cannon capable of firing three rounds in quick succession. The Autumn now had 300 M58 Archer missile pods, which were arranged in thirty columns and ten rows. Each pod contained 26 individual devices, equaling 7800 missiles. The Autumn was still armed with four Shiva nuclear warheads. One of these missiles was loaded aboard a Longsword fighter, which could be remote-controlled. Forty M910 50mm point-defense guns were installed, with overlapping fields of fire for point defense against single ships. The ship was also equipped with three HAVOK warheads. At just over 1.17 kilometers in length, the Halcyons were the smallest of vessels to be designated and structured as cruisers. Compared to later ships, the original Halcyons were sorely underpowered and undergunned: their Mark II fusion engines provided but a tenth of the output of modern reactors and their armament consisted of a mere six Archer missile pods and a single MAC gun. According to the AI Cortana, these ships were considered laughable within the UNSC fleet. When the Human-Covenant War erupted in 2525 a number of Halcyon cruisers were reactivated from storage and refitted. With the right upgrades, a Halcyon-class cruiser could be a formidable foe. During the Battle for Arcadia in 2531, the UNSC Pillar of Autumn teamed up with three other ships to destroy a CCS-class battlecruiser, suffering heavy damage but remaining combat ready enough to provide ground support for the UNSC Spirit of Fire. Notably, of the four human ships involved in the battle, it appeared to be in the best shape of the two surviving ships. Later, during the Fall of Reach, the upgraded Pillar of Autumn was able to inflict damage far beyond its tonnage, engaging and destroying Covenant frigates, a DDS-class carrier and a powerful warship of unspecified class. Later, in orbit above the Forerunner construct known as Halo, the Autumn destroyed four additional CCS-class battlecruisers under the guidance of the AI Cortana. While much of this success was due to the tactical genius of Captain Jacob Keyes and his crew, the upgraded Autumn was highly resilient and capable of unleashing tremendous artillery barrages. The ship's main Magnetic Accelerator Cannon was enhanced to fire in three-round bursts. While each individual round was weakened, this firing pattern typically ensured at least one projectile would penetrate a Covenant vessel's shields. Damaged, the targeted ship could then be overwhelmed with Archer missiles, nuclear weaponry, or further bombardment once the Autumn recharged its main batteries. Unfortunately, the ship and nearly all of its original crew were destroyed in an attempt to prevent the firing of the Halo ring, and to prevent the release of the parasitic life-form known as the Flood. The detonation of the Autumn's fusion reactors destroyed not only the ring, but the majority of the Covenant flotilla which had pursued it from Reach. 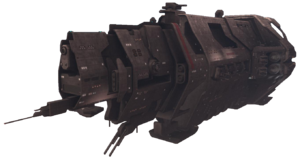 The Autumn-class heavy cruiser, commissioned into service following the end of the Human-Covenant War, is based upon the Halcyon-class cruiser Pillar of Autumn in both superficial design and name. Out of 50 Halcyon-class light cruisers built, the first 11 have the honeycomb superstructure while the other 39 have an unspecified one. UNSC Halcyon - The lead ship of the class. UNSC Pillar of Autumn - Participated in the Battle for Arcadia in 2531, destroying a Covenant battlecruiser alongside three other human ships and providing ground support for the UNSC Spirit of Fire. After refitting in 2552, the Autumn, captained by Jacob Keyes, was selected as the SPARTAN-IIs' chariot for Operation: RED FLAG, due to its new resilience and firepower. Destroyed by John-117 in the Battle of Installation 04 through wildcat destabilization of the engines, as a means to destroy Halo Installation 04. UNSC Roman Blue - The first ship to be captained by Terrence Hood; participated in the Battle for Arcadia. Shot down in battle between 2535 and 2552 and crashed on Eiro. Wreckage later salvaged by the Ace of Spades before an unknown vessel, possibly belonging to ONI, glassed Roman Blue's remains. UNSC Constantinople - Participated and destroyed during the Second Battle of Harvest in 2526. UNSC Persian Gate - Participated in the Battle of Alpha Corvi II in 2526. "Halcyon" is derived from the Greek word "Alcyone", which means "marked by peace and prosperity". The scrapped hulls of several Halcyon-class cruisers can be seen in the Halo: Reach campaign level The Pillar of Autumn and the multiplayer map Boneyard. The Pillar of Autumn's model from Halo: Reach is considerably larger than its original Halo: Combat Evolved counterpart. Indeed, it is longer than even the Marathon-class cruiser. The Pillar of Autumn plays a role in Halo: Combat Evolved, Halo: Reach and Halo Wars. In each game, the ship provides support to the player in some form. The UNSC Pillar of Autumn. A vertical cross-section of a Halcyon-class ship, showing the honeycombed internal layout. A Halcyon-class using its 50mm PDG against Covenant boarding craft in Halo Legends: Origins. Halcyon cruisers sitting in a decommissioning yard on Reach. A Halcyon class cruiser on the surface of Reach. ↑ It is unknown how many auxiliary craft and vehicles a Halcyon can embark. The Pillar of Autumn, depending on the in-game cutscenes, missions, and novels, was shown to carry at least: twelve Longswords, seven Pelicans, four Scorpions, and perhaps in excess of forty Warthogs. The Warthog count is partially based on the text of Halo: The Flood, pages 136-138. The docking bays shown in the cut scenes each revealed berths for sixteen Pelicans as well.